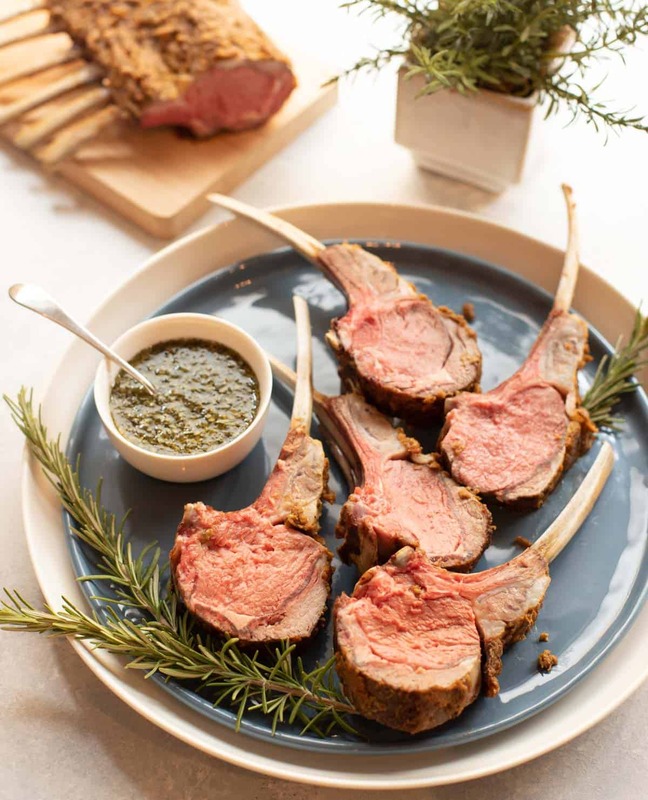 Mustard Crusted Rack of Lamb with Fresh Mint Sauce is an easy, elegant main dish that’s perfect for a spring or summer dinner. As a Colorado native, I grew up eating lots of grass-fed meat – including lamb. After all, Colorado is known as having the best, most flavorful lamb around! Nowadays, I love serving rack of lamb at a dinner party, especially in the spring and summer. It’s actually very easy to prepare; the key is making sure your butcher preps the rack for you. Make sure it has been trimmed – sometimes called “frenched” – which basically is removing all the meat, fat and membrane from the individual bones that stick out of the meaty part. The fat on the top of the meaty part should be cut down to only around 1/8-inch thick. Lastly, the chine bone should be removed from the bottom. For several years now, I have served my mom’s delicious recipe for Rack of Lamb with Nut Crust – which is also in our cookbook “A Well-Seasoned Kitchen.” This year, I decided to create a recipe that didn’t use breadcrumbs in the coating. I also wanted to pair it with the Fresh Mint Sauce I found in the recipe box from close family friends – the Gordons – ranch. It turns out that the Gordon’s Fresh Mint Sauce is a variation on the traditional mint sauce that has been served for years with lamb in England – evidently where the lamb + mint combo originated. Growing up, my mom often served lamb with mint jelly – which I’ve now decided was the US (store-bought) version of mint sauce. In my opinion, the English version is much better as it’s not sweet. 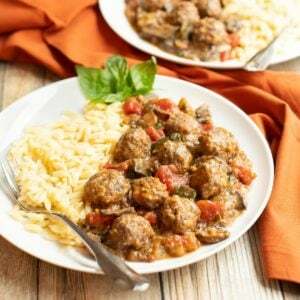 It’s an easy-to-prepare sauce comprised of chopped fresh mint, vinegar, sugar and water. The Gordons also add lemon juice – which I think makes it even better! After researching which herbs and spices pair best with both lamb and mint, I came up with a mixture of Dijon mustard, garlic, cumin, coriander, rosemary and paprika for the coating. It turned out to be super delicious on the lamb – and worked perfectly with the mint sauce, too! In a large heavy skillet (I like to use cast iron) over medium-high, heat 1 1/2 teaspoons of the olive oil. When hot (see Tip below), brown the rack of lamb on all sides – around 1 to 2 minutes per side in an iron skillet; a minute or two longer in a regular skillet. Set aside to cool, fat side up. In a small mixing bowl, stir together the mustard, garlic, cumin, coriander, rosemary, paprika and remaining 2 1/2 teaspoons olive oil. Brush top and sides of lamb with the mustard mixture. Place on a rack in a rimmed cookie sheet or roasting pan. Roast until lamb reaches desired internal temperature – 135 for medium rare, 145 for medium. Remove from oven and let sit for 10 to 15 minutes before carving and serving. In a small mixing bowl, stir together chopped mint, vinegar, boiling water, sugar and lemon juice. Cover and let stand in a warm place for at least 30 minutes, stirring occasionally. Serve warm or at room temperature. Make ahead: Mint sauce can be made up to two days ahead, covered and refrigerated. Mustard mixture can be prepared earlier in the day, covered and refrigerated. Bring both to room temperature before using. Reheating cooked rack of lamb: Wrap in foil and place in a 325 degree oven. Cook for 10 minutes to maintain same level of doneness; 15 minutes for next level (e.g., if lamb was originally cooked medium-rare, then 15 minutes of reheating will deliver medium doneness). Let sit for 10 minutes before serving. Note on rack of lamb: Make sure the rack has been trimmed – sometimes called “frenched” – which basically is removing all the meat, fat and membrane from the individual bones that stick out of the meaty part. The fat on the top of the meaty part should be cut down to only around 1/8-inch thick. Lastly, the chine bone should be removed from the bottom. Tip on testing hot oil: Place the handle of a wooden spoon (or other wooden cooking utensil) into the oil, touching the bottom of the pan. If bubbles steadily arise around the handle, the oil is hot enough!